I really don't eat a lot of fish, but I'm trying to change that. Back in February, my local supermarket had flounder on sale and I got some. It was sitting in my freezer until today. I found a great recipe for Fish en Papillote, which is just fish wrapped in parchment paper. The parchment paper acts like a bag that traps in steam which cooks the fish and keeps it moist. The recipe I found topped the fish fillet with julienned (matchsticks) red onion, zucchini, and carrot, but any quick-cooking vegetable would work fine. On top of the vegetables were 2 lemon slices, some thyme, and a pat of butter. The combination of the vegetables, lemon and butter creates a great sauce. The most important part of this is making sure that the parchment is sealed everywhere so the steam stays inside and cooks the fish and vegetables. 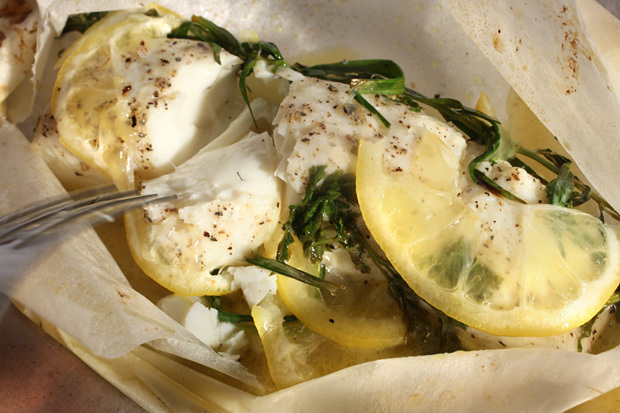 When serving, place the entire parchment sack on the plate and let your guests open them. I made some couscous with this, which soaked up the sauce from the fish and tasted amazing.